“Praise the Lord! We are a musical nation.” So the St. David’s Society of New York shone a spotlight on musicians in its Scholarship Programme during its annual dinner at the Yale Club in midtown Manhattan on Friday, 24 February 2017. An annual event since 1835, Society banquet number 182 celebrated with song. The Reverend Eli Jenkins lives in Milk Wood but the words of Dylan Thomas could well be spoken for the young professionals who’ve used their grants to aid them on their artistic passage. 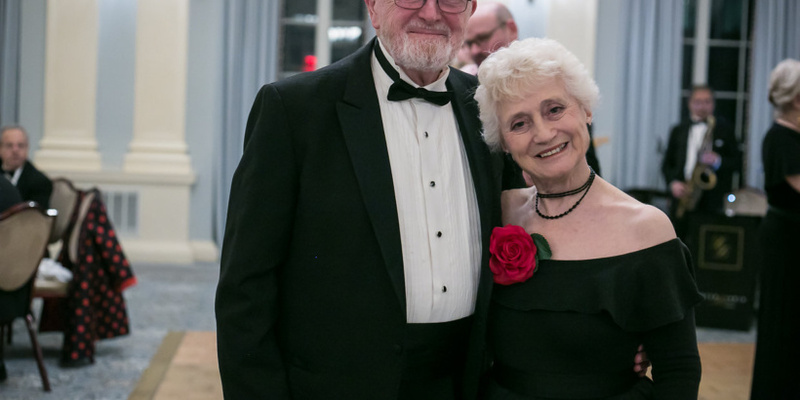 The evening’s Society Appreciation Award highlighted Thomas E. Bird and Mary Lynne Bird, he for his Scholarship Committee stewardship and she as the first of many successful recipients. Colin MacKnight and Chloe Wilson, two recent awardees, provided the musical sparks to light up the evening. To quote again from Dylan’s play for voices – “To begin at the beginning:” Through the years, the Society gave a student grant occasionally. Then in 1972, President Rev. Cyril Jenkins (no close relation to Eli) formally named a committee that awarded its first scholarship to Mary Lynne Bird. The Society Programme continues under current president David Morgan. From the outset, the Programme purpose was to serve students of Welsh descent enrolled in formal programs or creating individual projects. It was extended to those pursuing Welsh-related studies, especially in music, theatre, and literature. Three awards are named for Prof. Robert Fowkes and Rev. Kenneth O. Jones, both past presidents of the Society, and Ms. Ann Phillips, a Society member and generous benefactor. Professor Thomas Bird joined the St. David’s Society in 1965 shortly after moving to Manhattan from Princeton University. He served on the Scholarship Committee from1983 until 2013. During his tenure, fifteen years of it with Committee Chair Nancy Williams, committee members gathered at Nancy’s apartment, finding all requests neatly placed and ranked “in suggested order of worthiness” on the dining room table, ready for discussion and the awarding of the proper scholarship. There was no need to question her peerless decisions, merely decide the requisite amounts. Ms. Williams died at 87 in 2016. In 1972 Mary Lynne Bird, a coloratura soprano, was cast in the title role of Leo Delibes’ Lakmé for the New York Bel Canto Opera Company. The award from St. David’s allowed her to engage Igor Chichagov, “the aristocrat of vocal coaches” originally from Russia’s St. Petersburg Conservatory. With his help, her breakthrough performance, noted in reviews in The New York Times and New York Magazine led to over 60 major roles with Bel Canto and other companies in New York, New England, and the Mid-Atlantic States. Ms. Bird went on to sing Lakmé in half a dozen different productions. The St. David’s Scholarship played a key role in her operatic career. Prof. Bird is an Emeritus Professor of Germanic and Slavic languages in the Department of European Languages and Literatures at Queens College in New York City where he received the Presidential Teaching Award. He is a Past President of the St. David’s Society and also speaks Welsh fluently. Ms. Bird also served as Executive Director of the American Geographical Society (AGS) for 27 years as well as President of St. David’s. As AGS Director Emeritus, she was awarded the Charles P. Daly Medal “for valuable or distinguished geographical services or labors” in 2011. The musical entertainment for the evening was provided on piano by Colin MacKnight, a Doctoral Fellow at The Juilliard School and assistant organist at New York’s Church of the Resurrection under Music Director David Enlow (another Society scholarship winner and accompanist at the National Festival of Wales). Chloe Wilson, an actor at New York’s American Academy of Dramatic Arts, is from the Rhondda Valley. She loves to sing in her native language and she proved it well with songs from Beauty and the Beast as well as Leonard Cohen – in Welsh. Mary Lynne Bird then gave an impromptu a cappella performance of “Danny Boy.” St. David’s is a musical society indeed. Loraine Enlow, Music Associate for Youth at St. James Episcopal Church in New York and graduate of the New England Conservatory of Music (and wife of David Enlow), gave an impassioned speech on the importance of scholarships in education and heritage, music and literature, for building a stronger American artistic community. The assembled responded generously to the ensuing scholarship raffle. Then the evening’s rhythms changed, the music ended, and the Welsh flag came down until next year.